LAS VEGAS — In his speech at the 2017 Monster Energy NASCAR Cup Series Awards in Las Vegas, Martin Truex Jr. joked that Cole Pearn was just a “Furniture Row T-shirt-wearing Canadian.” And that would seem to be entirely accurate given that the crew chief is — a) from Canada — and b) known for a wardrobe comprised largely of 100-percent-cotton articles. 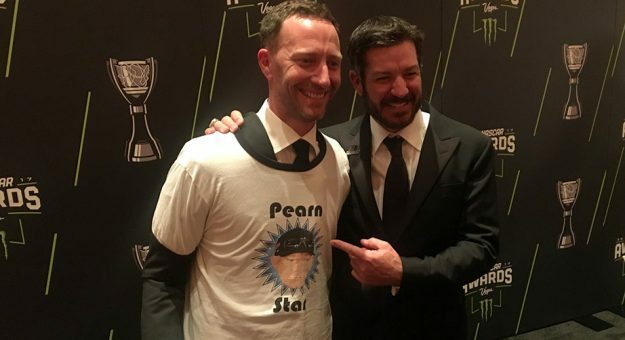 But when Pearn took an interest in a T-shirt designed by our own @nascarcasm, it was only fitting that after Thursday’s festivities the unique piece of clothing would land in the crew chief’s lap. So in the press room afterward, Pearn and Truex shared a light moment with the T-shirt when it was presented to him (see below).